The growing fad of having long and healthy nails is taking the media by storm. People are creating challenges and sharpening their nail art skills in hopes of keeping this craze alive. While the 100 layers of nail polish trend and intricate manicures had their day in the sun, they don’t hold a candle to Shilenkova Elena. Elena, a woman who’s somehow defied the nail growing odds, has grown her fingernails to an unprecedented length. Currently, they’re 4.7 inches long. Elena’s exceedingly long nails have undoubtedly garnered sufficient attention. Nail biters and cuticle chewers are desperate for her tips and tricks. According to Elena, she just hasn’t cut them in the past four years. Her nails have brought her into such international repute that she dedicated an Instagram account to them. 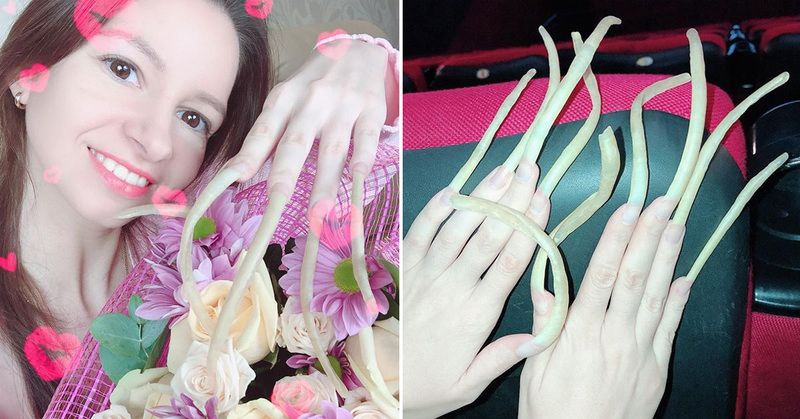 On her social media platform, Elena shows herself doing everyday tasks with the insanely long nails. From typing and zipping her pants to opening soda cans and tying her shoes, there’s not much Elena can’t do. Evidently, her nails are especially helpful in scoring dates. Men love Elena’s nails, and she often indulges them with a nail-laden massage. Elena hopes to keep her nails intact; that way, she can continue to impress the masses.